Two apartment blocks in two and three storeys stand at right angles to the existing street elevations. By having the head elevations of the new blocks face onto the street the continuity of each street elevation is ensured and a pleasant public square created. 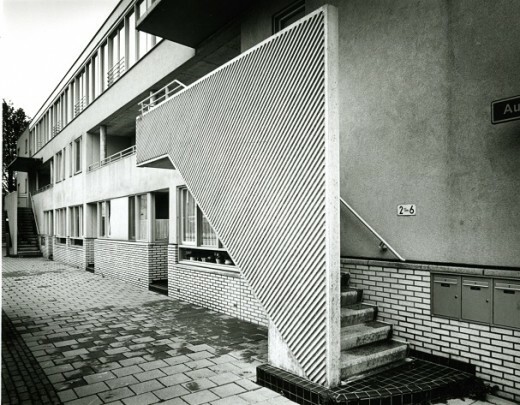 The complex of 22 social housing units boasts nine different types reached from porches and short access galleries and by the traditional front door. The architecture refers to pre- and post war Modernism: flat roofs, rendering, pastel shades, ribbed concrete panels, and lopsided balconies.